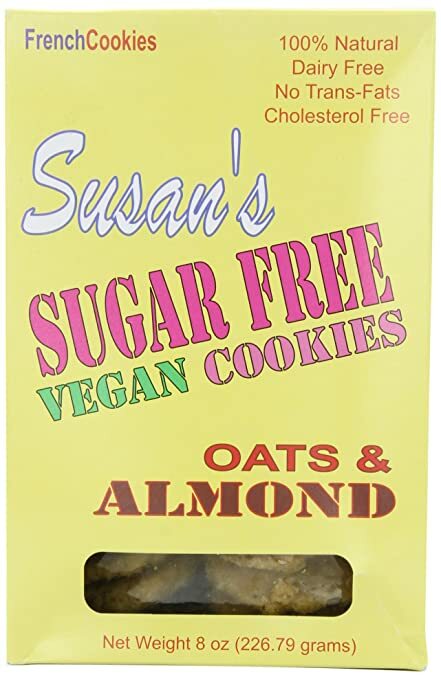 Susan’s Sugar Free Cookies is an American product, made by St. Armour, Inc.
Made without dairy, Susan’s Sugar Free Cookies, come in several flavors. : Almond, Ginger, Peanut, Chocolate, and Orange. They’re good for diabetics, vegans, and anyone who wants to avoid cane sugar, and animal products. The cookies have a crunchy, sweet taste because they’re made with malted barley flour, and malitol, a natural sugar substitute, similar to xylitol. Buy them at Whole Foods Market, Amazon, or order directly from the manufacturer, Susan’s Sugar Free Cookies. With the exception of a few urban areas, we live in a country that encourages sitting, because our towns and cities are planned around the automobile. We sit at the computer, in front of the TV, on the job, at the movies, dining out, and commuting to work. . In many cities and towns, sidewalks are inadequate for pedestrians, making the car an absolute necessity, even for short, walkable errands. Prolonged sitting weakens our muscles, makes us lethargic, creates a weak core, which in turn, develops poor posture. Medical doctors consider sitting to be the new smoking. Do you have a job where you’re sitting most of the day? Do you have chronic low back pain? Does your neck feel stiff? Are your muscles so sore you can’t sit down? Is the time spent riding your horse not as enjoyable as you’d like it to be? Targeted exercise provides solutions to remedy these problems. While you’re moving, the core controls the position and motion of the torso over the pelvis. A strong core improves sports performance, and maintains healthy posture. 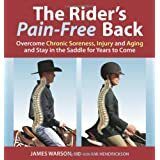 Targeted exercise provides solutions to help you get rid of muscular tension, and weakness, develop better posture on and off the horse, and makes riding more effective. Pilates Mat and Reformer exercises are designed to make your core muscles strong. If you’re not inclined towards Pilates, no worries, you can opt in to a fitness-based core exercise routine, using specialized core equipment to get the job done. Core exercises can also be performed without any equipment. If you’re a Yoga fan, there are many poses that will strengthen your core muscles, stretch your Psoas, Back, and Hamstrings. As you can see, there are many ways to stretch and strengthen your muscles. Here are a few suggestions. Stretch the Psoas Muscle because this inner hip muscle tightens up when you do alot of sitting. Stretch your Back to release tension in tight muscles. The Hamstrings are the muscles of the posterior thigh. Theses muscles tighten up from excessive sitting. If you frequently do stair climbing, or cycling ,you should be stretching your Hamstrings on a regular basis. Strengthen ;your Back and Abdominal Muscles, because these muscles work as a team to keep your posture healthy, and your spine well-supported. This is another post about fitness accidents. Only this time, it was a tv stunt gone bad. Did you ever notice someone at the gym walking backwards on a treadmill? Did you wonder whether they were into a new, trendy form of cardio exercise, trying to break the monotony, or maybe you thought they were doing something risky? On January 15, the Price Is Right announcer, George Gray, fell while walking backwards on a treadmill. He held his script in one hand, and his microphone in the other. While reading his script, he took a quick fall landing on his back. He managed to get up, gain composure, and continue the show. He was lucky he didn’t suffer a head injury. Treadmills are made for improving heart health. If you enjoy using a treadmill, use it safely. Walking backwards on a treadmill, increases your chances of falling. Walking backward as a land exercise, is used to improve balance, not heart health. It only takes a split second to be thrown off balance, landing on your head, or your back. At the very least you can strain muscles, which, depending on the severity, can take weeks to heal. Muscle strains can be very painful. At worst, serious head injuries, lacerations, and broken bones. By all means, don’t use it for an entertainment stunt.